Did you get an invitation to join Webtalk from one of your friends and want to get more information before making the decision? I guess you might have a lot of questions. What is Webtalk? How is it different from other existing social media platforms? Is Webtalk a Scam? Can I make money on this new website? Why should I join Webtalk? Is it worth my time? I was in the same situation a few days ago when I was invited to join Webtalk by one of the peers at Online Internet Marketing University. Being a cautious person, I went to Google and did my research, reading many posts about Webtalk. As a next step, I’ve decided to join and try the platform myself, to get a first-hand experience with it. 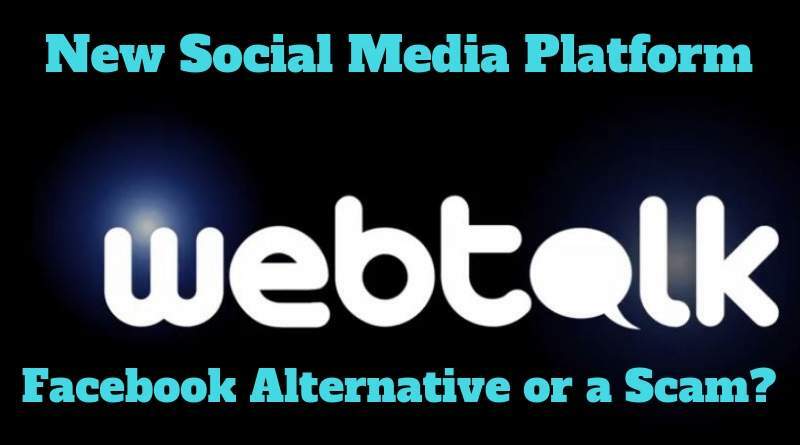 Webtalk is a brand NEW social media platform that promises to combine the best features of Facebook and LinkedIn and to offer improvements where the other platforms have issues. 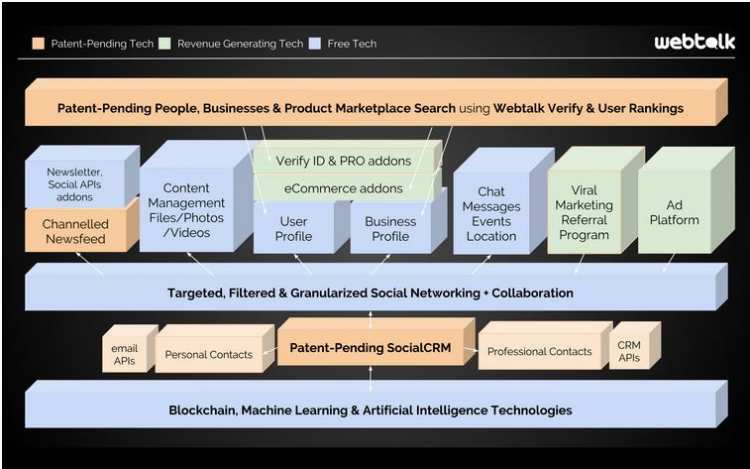 Its SocialCRM (contact relationship management) and the news system are patent pending (check out https://patents.google.com/patent/US20170103134A1/en). The major improvement would be sharing the income with the members and I’ll talk about it in more details later on in this review. Webtalk platform was built with the cutting edge technology over the last 8 years. It’s being released in stages, step by step revealing the whole vision. After Beta launch in July 2018, the number of users grew at a skyrocketing rate. 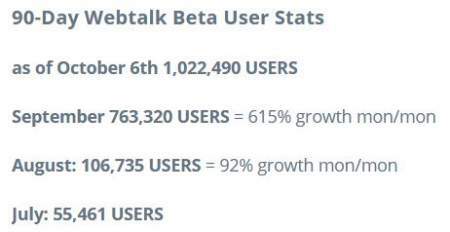 On October 6th, 2018, Webtalk reached a milestone of 1 million users in the Beta testing phase. It’s worth to mention that Webtalk pledges to donate 10% of its profits to develop the countries where the revenue was generated. The donation will take the form of real estate investments to build new hospitals, schools, parks, and other community benefit facilities. Webtalk founders are RJ Garbowicz, Andrew Peret, Basit Hussain, Jeff Catherell and Jamie Pews. 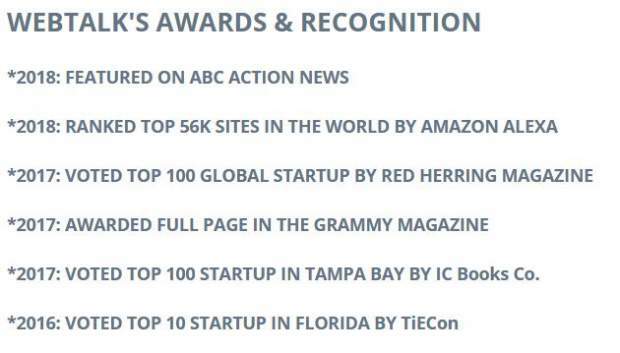 The new platform was noticed by major magazines. It’s already ranked as one of the 42K world’s most popular websites and the rank is climbing up in the global Alexa ranking about 1K every day. During the Beta testing, you can join Webtalk by INVITATION ONLY. This is done in order to protect the platform from fake users and bad actors. If you are interested in joining, click here and use my invitation. Why Webtalk? How Is It Better Than Facebook? When I got the invitation to Webtalk, it caused me to think – what I don’t like about Facebook? What I’d like to be different? Here are several things that came to my mind. Initially, my purpose of joining Facebook was to share my pictures and updates with the family and close friends. Later on, I added not so close friends and acquaintances as well, just to keep in touch. My friends’ list doesn’t include any current colleagues or people I don’t personally know. Last year, I started to use Facebook to search for online business opportunities by joining various groups and chatting with many people. I had to say “no” to any friend request from the new contacts, as I didn’t want to mix business partners with my family. In my opinion, pictures of my kids are not supposed to show up on the news feed of my prospects, and I don’t want to see what they ate for dinner last night. Ability to segregate family, friends and business contacts would be a great way to keep everything on the same platform. 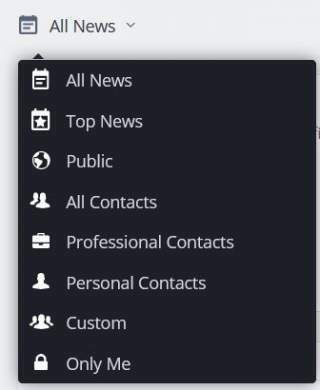 Organize your contacts as personal or professional – a combination of Facebook and Linkedin in one place. You can further refine the category inside professional contact as client, colleague, vendor, classmate and more. For your personal contacts, you can choose from friend, family or acquaintance options. In addition, you can add searchable tags and timestamped noted to the contacts, like company names, common interests and more. When you come to post something on Webtalk, you can choose the right audience for each post, using the categories above. You also can make the post confidential, disabling the sharing option. This is one of the major complaints about Facebook. Many people don’t like the choices that Facebook makes for them when it compiles the news feed and pulls in only the news from a small list of friends and groups. Recently, more and more ads are incorporated in the Facebook feed. Check it out – the second item is always an ad. In my news feed, I only see the updates from the friends whose profiles I checked recently. Same goes for the new posts from my groups – I only see them from the groups I visited or posted in during the last weeks. Facebook thinks that you always want the more of the same. Several months ago I was into Instant Pot recipes and my feed was full of pictures of the dishes made in this magic appliance. 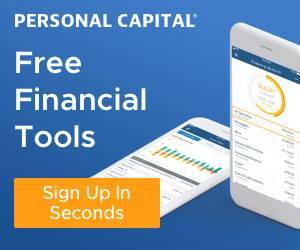 Last month I looked for online business opportunities, so my feed is overflowing with work from home job offers (unfortunately, most of them are pure scams), but no recipes at all. The ads on the feed are picked from the same topics – blogging, affiliate marketing, leads generation etc. Facebook tries to match the ads with your recent interests, but it quickly becomes boring to see these very similar offers. What do you want to see in the new feed is absolutely under your control: chose to see new from personal or from professional contacts, add specific keywords, get only video posts – use various customization options to filter exactly what you want to see now. Change your choice as frequent as you wish. At the Beta testing phase, you have to be invited to the platform by one of the current members. Here is my invitation that you can use to get an access. 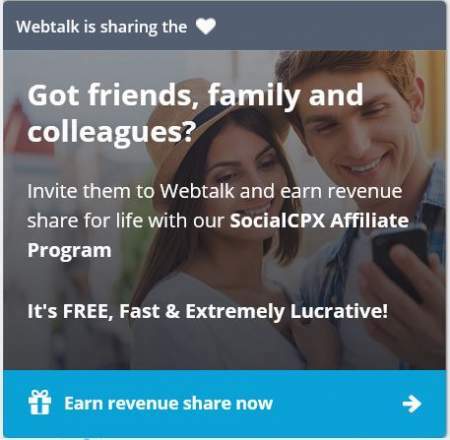 After you join Webtalk, you should set up your profile properly, otherwise, you won’t qualify for the affiliate program. 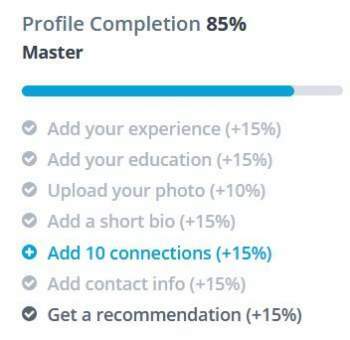 You’ll have to add a profile photo, fill out the “About Me” section, add information about your education and experience, choose several interests. In addition, you must have at least 10 connections, be it your referrals or other people you know who already have joined Webtalk. 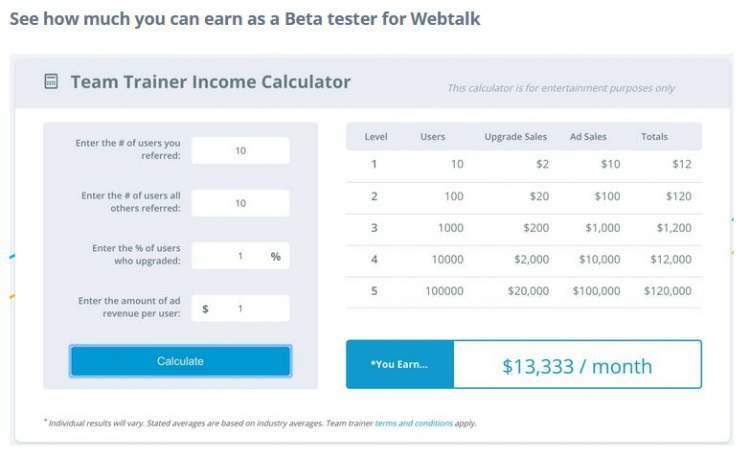 Can you make money with Webtalk’s affiliate program? 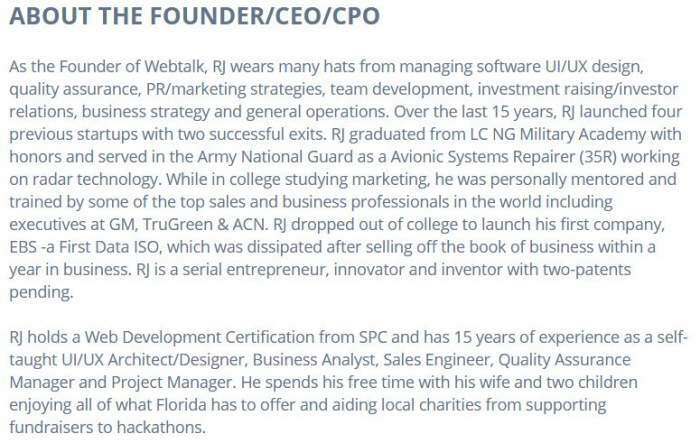 The promise of the Webtalk founders is to share up to 50% of the revenue with the members. Beta-affiliates will receive 10% of the revenue generated by 5 levels of their referral network for LIFE. The members that will join after Beta is closed will receive 10% on their direct referrals only. Currently, Webtalk is in a Beta testing phase. It means that not all the planned features are already live. The affiliate revenue share program is not paying any money right now. It will start paying out once the Beta testing is completed. If you are interested to join, better do it now, to get 5 levels of referrals. Here is my invitation link again. How many users you will have in the referral network? It’s up to you if you want to put some efforts into bringing your friends, family and colleagues to Webtalk. Would your referrals be active in inviting more people and spending money on upgrades and products? Social networks have a potential of a super fast growth. In about 4 months, Webtalk has reached 1 million users. I think it’s quite impressive. How much revenue the company will be able to generate per average user. The sources of income can be advertising, premium user upgrades, transactions fees, selling products and more. This is something we can’t project right now. Probably, it will take several years to develop various income streams. What I already can see on the website is some advertising by GoogleAds. For now, it’s just one banner on the page and is not annoying. As a sample, you can look at the following table. The assumptions are that each referral brings in 10 new members and the company earns $1 of monthly ad revenue per user. Once the affiliate program is officially launched and you start earning commissions, you’ll be able to request a payment through PayPal, Direct Deposit or Webtalk’s Visa Payroll Card. The payments are planned to be made on monthly schedule, with a minimum amount of $100. Does Webtalk have a mobile app? As of October 2018, there is no working mobile app. However, Webtalk has plans of launching both iPhone and Android apps soon. Does Webtalk have a Messenger? Not yet, but on the founder’s profile, I see the statement that Webtalk’s EventWave – Events and Messaging app – is coming soon. As with the other promises – we’ll need to wait and see. You can join Webtalk for free, so there is no money to lose. There is no requirement to provide any sensitive personal information like a bank account or a credit card. I don’t see how Webtalk can scam you. There is a risk of wasting your time in case the platform doesn’t succeed. But this is the truth with any type of business, right? Webtalk is a brand new platform, currently in Beta testing phase. There is no way to predict its future success, as it depends on many factors. The platform is built with a lot of thought about user experience and customization. 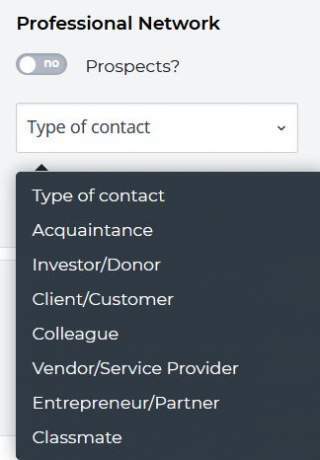 The features of contact’s categorization and new feed control provide the option of using one platform for different types of connections, from family to business partners. Webtalk’s affiliate program is a rare find. Lifetime earnings of 10% revenue share from 5-tier referral network (for beta affiliates only) is a generous and lucrative offer. Many existing MLM companies would charge a monthly fee to let you in such a program. Webtalk offers it completely FREE. The marketing materials look professional and demonstrate a high quality (compared to some other popular programs, like myEcon, for example). Looks like the company takes everything very seriously. The founders are known and active on the platform, posting news and updates on a daily basis. A few days ago, I asked RJ Garbowicz a question and he replied in about two hours! Till now, I’ve seen such owner’s engagement and availability only on Wealthy Affiliate platform. 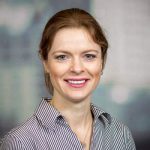 Webtalk is entering a saturated market of social media, with powerful competitors like Facebook, Instagram, Twitter, LinkedIn, Pinterest and others. It’s not going to be easy to win the race against them. Even such a big name as Google announced on October 8th, 2018, that it’s going to shut down its Google+ service. If Google lost the social media battle, it can happen to any other player. At this stage, Webtalk is similar to a lottery ticket – you can win a big prize or be left with nothing. The good thing that made my decision easy is that this ticket is given to you for FREE. There is nothing to lose, except some time you might invest in building your referral network. The upside might be very rewarding. For these reasons, I decided to join Webtalk. If you agree with my conclusions, you are more than welcome to use my invitation link here. What do you think about Webtalk? Would you like to be part of the upcoming launch? Leave me a comment below with your insights! Very professional review Mary, as usual I would say. Anytime I have doubts about some business opportunities, I come to your website to see if you have reviewed them. You have got me covered once again! This was a boo wow! I had got a message from a friend who invited me to webtalk. You provided me with so much insight I had to join in mid way. Thank you so much for such a post. It was an eye opener and well, i’m now a new member. Today is a Boo Woo day (Halloween)! Welcome. Send me a connect request and we can chat there. Thanks for the clear explanation about what this social media platform is all about. I must say that Webtalk has been the “talk of the town” lately. I heard my friends and colleagues talk about it and even read it from an online community that I’m a part of. Naturally, it kind’a piqued my curiosity so I started looking into it. While it offers better privacy and control over your posts and what your friends will see, I think this is more like a referral system. I like the idea that you can actually make money when any of your invites will sign up, I’m just not sure if this is going to outlast Facebook. Anyhow, I might consider accepting your invite, thanks Mary. I tried to provide an objective view of this new platform. It’s hard to say now if it’s more like a social media or MLM (though for free!). Many people think that Facebook and Co should share some revenues with the users. In addition, Facebook has many regulatory issues and internal disagreements about what should or shouldn’t be allowed to be posted. Its influence in some countries is too high to leave it open to everyone and everything. I’ll be glad to see you on Webtalk. Make sure to send me a connect request. There is a very active core team on Webtalk. They even provide a free course on Webtalk promotion. I’m posting on Webtalk from time to time and waiting for new features to be released. Thank you for sharing with us such important review on Webtalk.I heart Webtalk from a friend of mine but i was not interested thinking that it is another social network like facebook .After reading your review i found that i was wrong about my judgement because i have feeling that Webtalk is more enjoyable than facebook. I am happy that day by day i learn something new .I like learning from intellectuals.You made my day. Webtalk has to prove itself, we are all super curious to see how it will develop. I can’t really predict if it’s going to be a success or failure. The only thing I see is that there is no harm in joining and testing it. I’m glad it was interesting for you. Can I join using my mobile phone, or does it have to be on a computer? Sure you can! Just click on the link in the post and sign up. Webtalk doesn’t have an app yet, but you can use the site via a mobile browser. Tremendous post. Thanks to your excellent explanations, I went and opened an account there. See you there. Great to see you visiting my blog, old friend! I have never heard of this platform before, but I am interested in checking it out. I wonder how much traction I could get with promoting my blog – only one way to see! Thanks for sharing, and for the invitation! I’ve heard from several members that it helps with blog traffic. A great post, wish i could do the same. I have already joined webtalk, and thanks for sharing. I tried to share all the information I found. Hi Mary, we’ve just followed each other in Webtalk, I thought I’d call in and read your excellent review. I have just shared a video link from YouTube, copied and pasted the link and it plays on the Webtalk platform. On Facebook, you’re diverted to Youtube to watch. They said they will improve many features – this is a great start for me. I really like the way you can network your business and personal relationships alongside each other – create as many networks as you want, it’s so convenient. Thank you for introducing me to Webtalk. It has some great features, as you mentioned. I hope it will grow and make money, allowing people to communicate more efficiently. Looks like a great social media platform, what I liked the most is that it is possible to have a personal and a profesional profile at the same time, like LinkedIn and Facebook together. But they definitely need a mobile app, since nowadays tons of people use a mobile phone to use social media. I’m sure this is going to be a massive social media. Thank you for keeping us abreast of it. You are right. Without an app, it won’t be possible to get close to Facebook, as at least 60% of users browse on their mobile devices. I hope Webtalk will release its mobile app really soon. This article was an eye opener. I had heard of webtalk, this review has cleared the fog a little and I might just join to see what the insides look like. Thank you Mary. Webtalk sounds really interesting! It’s good that people are working to create new marketing websites to fix issues, as well as make it easier. This was really well written. Thank you for sharing! I’m always amazed by people’s creativity and the ability to reinvent a wheel and make Tesla out of it. Who knows, maybe it will be a big hit! And if not, at least we can’t lose money on it. Mary, I had never heard of Webtalk, and what a great business model they’re creating. Many of the things I hate about facebook are covered with Webtalk. I’m so tired of seeing news feeds when all I wanted to do was share with my friends and family. You’re story resonated with me. Thanks again, I’m joining now. Sometimes all I want is to check on my friends and family, but my feed is clogged with ads and other stuff. It’s a miserable feeling of having zero control on the news I have to see on FB. I’m glad you’ve joined. I hope it will turn out great. Yeah, Webtalk! This seems like a better future of social media. Though still in Beta testing like you said, I truly hope it would meet up to its claims and plans. Plus, I so much love the fact that users are given the opportunity to monetize the platform. I’m with you in the hope to see great results from Webtalk. There is no way for us now then just wait and see. Hi Mary, this looks like a great idea, will be good to give FB some competition. I will check it out. Thank you for checking it out. Webtalk looks like a legitimate effort to create something good in the social media field. I’m so curious to see how it will come out! Well, it’s about time Facebook got some real competition. And we’ve all been helping them make money for years, so it’s nice to see a company that wants to give a little back. Thanks for sharing. I’ll definitely give WebTalk a look. I agree with you. Facebook became too annoying with all the adds and filtering our news feeds.